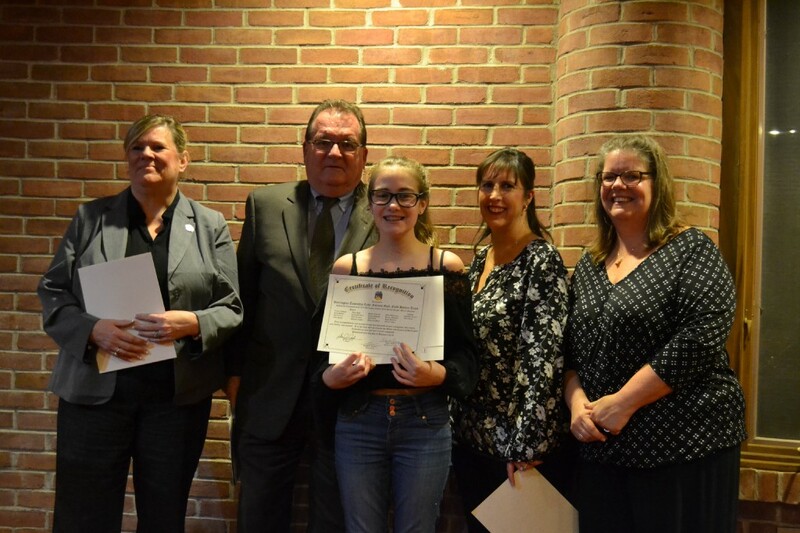 Burlington Township Lady Falcons goalie Grace Westrich receives her certificate of recognition for the team’s championship season at a regular meeting of the Burlington Township Council. From left, Assemblywoman Carol Murphy, Mayor Brian Carlin, Grace Westrich, Coach Christine Carney and team coaches Christine Carney and Ann Stein. Girl power was the order of the day at the regular meeting of Burlington Township Council on Tuesday, Jan. 8, as the Burlington Township Lady Falcons Gold field hockey team was recognized for finishing an outstanding season as the 2018 Burlington County Field Hockey League Senior Division champions. The team went undefeated in the Senior Division of the Burlington County Youth Field Hockey League with a record of 9–0. Five of the victories were shutouts. Goalie for the Lady Falcons, seventh-grader Grace Westrich, allowed only 10 goals the entire season. The field hockey team consists of girls in grades sixth through eighth, most of whom have been playing together since first grade. They attribute much of their success to how well they know each other and everyone’s playing style. “We’ve become more than friends, we’re like a family,” said Westrich. The night’s meeting began with a congratulatory presentation to the team by Mayor Brian Carlin and Assemblywoman Carol Murphy. One by one, the girls were called forward to receive a certificate of recognition for their victorious season. According to Carlin, just a few years ago Burlington Township didn’t have a field hockey program at all until the director of the recreation department, Diane Flannery, approached the council about creating one. “She found the right group of ladies to start the program who were invested in it, who helped build a program from the ground up, and we’re seeing the level of success, not only here, but at our high school,” said Carlin. Murphy also congratulated the team on its accomplishments. “I am so proud to stand here and congratulate you all for a job well done. To tell you how proud I am as a female legislator, elected official and as a woman to see so many young ladies empower themselves to be the best that they can, not only academically but also athletically. You are all winners regardless of how much you win on the field,” said Murphy. Few in attendance at the meeting were more proud of the girls than their coaches, Ann Stein and Christine Carney. Both have daughters playing for the Lady Falcons, seventh-grader Cate Carney and eighth-grader Mackenzie Stein. “We’re very proud of them, they’ve been playing together since they were 6 or 7 years old and they had such a stellar season, they played so well as a team,” said Carney. Like her players, Carney also points to how long the team has been playing together as the key to the championship season. “They just sort of know what to do, they communicate very well with one another on the field. Several of them are able to play different positions so we can move players around where we need to and they adapt very well to change,” said Carney.